BTS attended the 2019 Grammy Awards held at the Staples Center in Los Angeles on the 10th (local time) and they caught the eye of the audience with their neat suit on the red carpet. In particular, various U.S. media outlets have been posting pictures of BTS members on social networking sites with the local audience expressing their strong interest in BTS. The local is also responding to the situation the same as their fans, and the attention of local people is particularly high on V. BTS V has dominated real-time trends around the world including France, Germany, Italy and Saudi Arabia on Twitter. 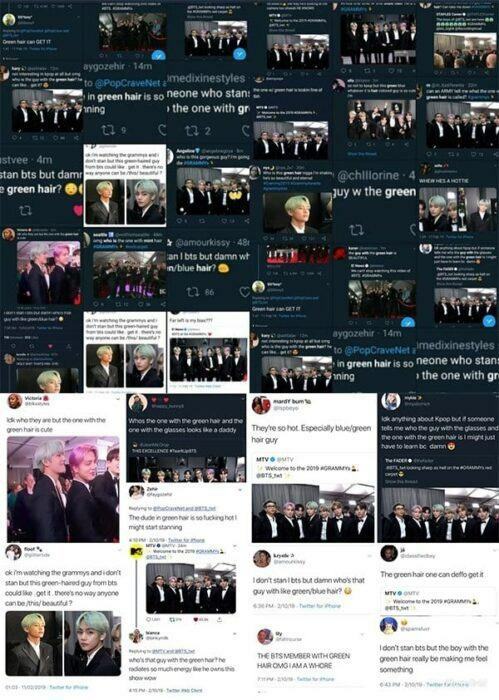 As soon as he got on the red carpet, his neat black suit and mint-colored hair, V showed his well-deserved world’s best handsome appearance and his charismatic charm on the red carpet, SNS is now flooded with responses asking about V and this even created the automatic search term “The guy with green hair”. BTS has attended all three major music awards in the U.S. by participating in the Grammy Awards, raising K-pop’s status even more.